Teenage Engineering really have their finger on the pulse a specific niche of music users out there, and sales of their OP-1 synthesizer prove this to be true. As we mentioned in our first NAMM report this year, Teenage Engineering have been stealing the show at NAMM for three years now, first with the release of the OP-1 and this year with both a system update for the OP-1 and a new modular environment for experimenting with audio and hardware. We caught up with the Teenage Engineering team at NAMM this year to get the details on these exciting products. The new OS update that was released this week brings lots of new features that users had been asking for including sequence sync for MIDI, a drum synth and a way to play multiple drum sequences. In the below video we catch up with the Engineers at NAMM to get a closer look at these features. While visiting the Teenage Engineering booth we were struck by something interesting and had to immediately ask, “are all three of those three OP-1′s all running in sync?” (Three USB based MIDI devices running in sync? How?) 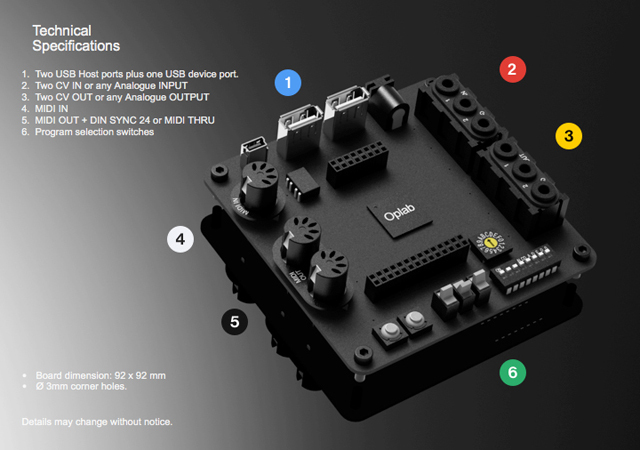 One of the coy engineers grinned and said “Yes, they are all running through the new OP-Lab.” This $300 device (shipping in March) boasts two USB host ports, a USB device port, two CV inputs (or any analog input), two CV outputs (or any analog output), MIDI in, MIDI out, and various program selection switches on a 92 x 92 mm square. This may sound like technical mumbo jumbo so think of it this way – sync anything with anything. Yes, it’s that cool. The Oplab Musical Experimental Board allows you to interconnect virtually any electronic musical instruments. And finally it’s just plug and play. No more hassle with one box for MIDI and another for CV or a third for USB. Oplab has it all in one place. Just connect your cables, set the appropriate scenario and experience a perfect sync. We have worked hard to design some nice accessories for you to start lab with. Like the TS-1 sneaker with a special made rubber side pocket for our TS-1W wireless Gyro sensor. Trigger a kick drum or maybe an invisible sustain pedal? 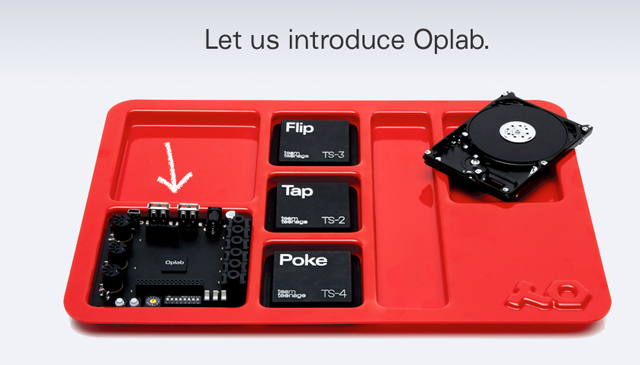 One of the fundamental ideas behind Oplab is to let you connect things, toys or junk that you already have around you and to make it interact with your electronic musical instruments. With 2 x 12 bit switchable Digital in- and outputs you can interconnect more than just synthersizers. All in sync with your music or controlled by MIDI data from your sequencer. Oplab has two standard USB host ports and one mini USB device port. So, any mobile device or computer that sends MIDI over USB or can output a audio trig click sound will work as a controller or slave via your Oplab. Easy conversion from MIDI to CV and even Roland SYNC for the 303, 606 etc.